Use this to apply the cleaner, simply pour the concentrated cleaner into the applications reservoir. Set the dilution dial to \"C\" (1:6), attach it to the hose, and spray on roof. This saves time and eliminates the need for mixing. A minimum of 150 feet of 3/4\" diameter heavy duty contractor hose is best. Smaller hose diameters like 1/2\" or 5/8\" will reduce cleaning efficiencies when rinsing. Use a 3/4\" ball valve on the hose end. This will allow you to easily shut off water flow to change from cleaner applicator to rinsing tool. Note: Make sure the valve you choose does not restrict water flow. You will need a hand held pump-up sprayer for applying DEFY Stain Blocker. A sprayer with a large 2-3 gallon tank works well and saves refilling time. A 1/2 hp or slightly bigger utility pump rated for a minimum of 20 gpm. Available at most farm supply and home improvement stores. Note: A minimum of 80 psi of water pressure is best for rinsing. A small pump is helpful because water pressures will vary greatly from each location or municipality. Additionally, pressure is lost from the rise in the hose when rinsing on roofs. Water resistant boots made especially for walking on roofs, with special replaceable pads designed for maximum grip on roofs are highly recommended. 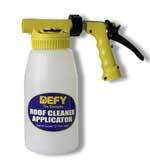 DEFY Roof Cleaner breaks up the masses of algae rooted to the shingles\' surface into very fine particles. Then, the specially developed rinsing tool is used to remove the algae from the surface. The rinsing tool, attached to a garden hose, will remove the algae spores and any remaining roots more effectively than just rinsing with a garden hose. This is no more harmful to the roof than a hard driving rain. This means the roof stays cleaner longer, and no damaging pressure washing is needed. Once the roof has been properly cleaned and rinsed, it should be treated with DEFY Stain Blocker for Roofs with a pump-up sprayer. Maintenance coats should be re-applied about every 2-3 years, depending on climate, orientation of the roof, and surrounding trees that keep direct sun off the roof. In some extreme cases, maintenance coats may need to be applied yearly. In ideal situations, maintenance coats may only be needed once every five years.